You don’t have to suffer from glossophobia to hyperventilate at the thought of standing up in front of a large hall full of people. 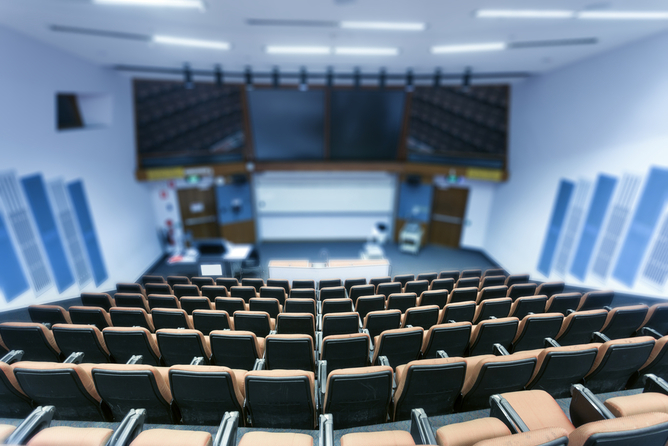 Many university lecturers dread the thought of teaching a large class. That’s because teaching large classes is hard. It can be scary and stressful, and it takes a lot of time and preparation. Adding to all of that stress, large classes also don’t have a good reputation when it comes to fostering student learning. We know that students struggle in these contexts to stay engaged, to perform well and to develop important skills like critical thinking. But large classes are a reality in many developed and developing countries. They form part of the drive towards the massification of higher education. So what is a “large class”? It can’t be defined by a numerical threshold: instead, it’s a context where student learning is negatively impacted by the number in a class. Large classes have different meanings in different disciplines. A biology class may have more than 800 students before it’s considered “large”, while a sculpture course may be classified as “large” with 20 students. There are two dominant logics that drive the emergence of large classes in higher education. The first is about efficiency, and suggests that large classes will result in increased revenue and decreased costs to the “system”. The second is a progressive logic which argues that higher education is key to resolving problems of poverty, inequality and economic development. To do this, access to higher education needs to be increased. Neither of these logics places student learning front and centre. Nor do they consider how student learning might be negatively affected. How can we address this? I don’t think we can solve the challenges of large classes outright – but we can attempt to mitigate their negative effects by adopting strategies that we know are good for student learning and generally good for speaking to large groups. Here are some things that may work, based on research I’ve conducted and recently published in book form. 1) Treat your large class like it is a small class. Small classes are great for learning because they allow interaction, discussion and debate. Yet many lecturers actively try to avoid this in large class scenarios. This avoidance is usually justified through concerns about “managing” and “controlling” students. Lecturers argue that a class may become unwieldy if students are allowed to speak. But unwieldiness can be avoided by properly structuring the interaction moment. 2) Integrate problems into the class and get students to figure them out. I start each of my Introduction to International Relations lectures with a problem – usually something that is rooted in a current event. The problem is related to the concepts being discussed that day in class. I get students in my class of more than 400 students to respond to the problem and suggest how to solve it. More than half of the class participates, and it never gets out of control. Such a focused exercise gets them to apply their knowledge and experiences while keeping them connected with the purpose of the lecture. 3) Change your teaching approach every 15 minutes. Students have an average attention span of between ten and 15 minutes. So mix it up a bit. You don’t need to change the subject matter, but change the way it’s presented. I use things like class discussions, YouTube videos and podcasts to deviate from a standard lecture format in the classroom. This keeps students engaged and on topic. 4) Structure assessments to build on each other and make them about responding to problem scenarios. Noticing a theme here? Student engagement and performance in large classes is a big problem. We need to find ways to connect with them, and introducing a practical element to what they are doing can help. Students also need opportunities to learn what is expected from them in terms of assessments. When opportunities for direct guidance from the lecturer don’t exist, like in large classes, we have to find other ways for students to learn from making mistakes. Structuring assessments to build on each other (some call it scaffolding) is also important. We know that students can adapt to the expectations of our learning environments, but they need opportunities to do so. Continuous assessment allows students to make mistakes and to learn from these without necessarily failing the course. This adds to your marking load – but even this can be mitigated by adopting different types of assessment approaches. For example, I have two online multiple choice quizzes and three writing exercises. The quizzes are marked automatically online. Great teaching assistants help with the marking of the writing exercises. 5) Don’t be scared to have fun and experiment with different approaches and strategies. Teaching is ripe with opportunities to try different innovations. Some will work and some won’t – and that is OK.
6) Stay positive. Big classes involve lots of different types of students who have different experiences and understandings of the world. Some will be faster than others to get to the conclusions we want. Just remember, though, that if they knew all we do, they wouldn’t need to be in class!